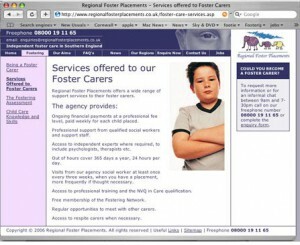 Launched in Spring 2006, Regional Foster Placements is a re-branding of two regional companies; South West Placements and South East Placements, in to a single entity. In conjunction with the website, Design Web Consultancy developed an advertising campaign aimed at recruiting new carers and increasing awareness of the company and its role to the care sector. Key to the site’s success has been the client’s commitment to targeted PPC Google and Yahoo Adword campaigns.